A father of a 4-year-old girl broke down in court after the girl’s mother and mother’s boyfriend who were charged with the child’s death made an appearance on Tuesday, March 13. It was an emotional day for Mickhal Garrett as he watched his daughter’s suspected killers walk out into the court. Sierra Day, 23, and Deonte Lewis, 26 — both from Ohio — have been charged with aggravated murder in the death of Aniya Day-Garrett who were looking after the child when she died on March 11. They are both being held on a $1 million bond each. Aniya had suffered a stroke which was allegedly caused by blunt impacts to the head with a subdural hematoma, according to the Cuyahoga County Medical Examiner’s Office, reported Cleveland.com. She was later pronounced dead at Euclid Hospital. According to Fox 8, the hospital reported the little girl’s death as a suspected homicide. This was later confirmed by the medical examiner’s office. Officials also found evidence that Aniya was malnourished. Garrett and other family members told reporters outside Euclid Municipal Court on March 13 that they had suspected the 4-year-old was malnourished and was being physically abused by Day and Lewis in recent months. 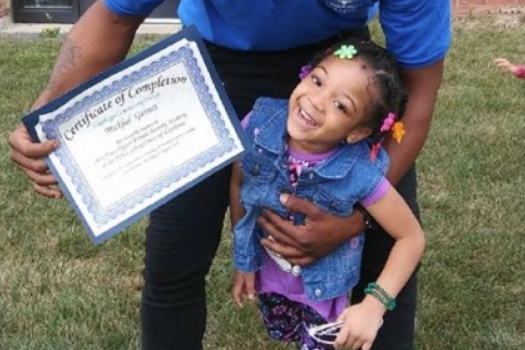 “This beautiful 4-year-old daughter’s life was cut down, senselessly,” Aniya’s paternal grandmother, Rachael Garrett, told reporters, reported Cleveland.com. “Beaten, abused, battered, starved … you have to be heartless,” she added. The family had made a number of complaints to the Cuyahoga Cuyahoga Children and Family Services to report bruises on the girl’s body, such as rug burns and black eyes. The agency confirmed that it had received three calls about Aniya in 2017 and was investigating the claims. However, the agency concluded that there was not enough evidence to warrant removing the child from her mother’s home, reported the news website. “I did everything in my power to let them know, you know, that I was a stand-up dad and that my daughter was being harmed and abused at home and this was an emergency,” Garrett said, reported Fox 8. He also added that he was petitioning for emergency custody at the time of his daughter’s death. The girl’s father has been fighting for custody of the 4-year-old, a relative said. Police are still investigating the circumstances surrounding the child’s death. No further information has been released. The family has set up a GoFundMe page to raise money for funeral expenses. As of March 15, they have raised over $3,100 of their $10,000 goal.